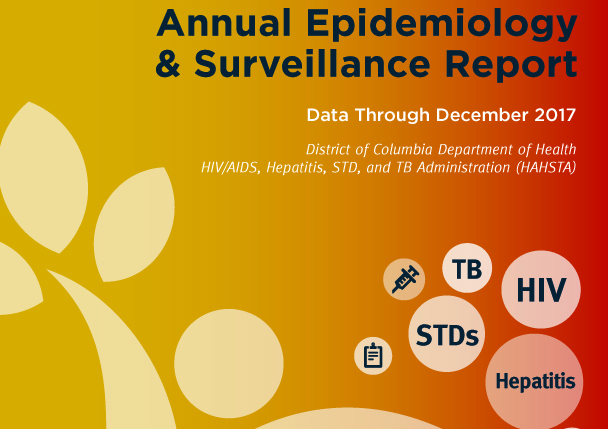 The Annual Surveillance Report for the District of Columbia presents a snapshot of the District’s HIV, Sexually Transmitted Diseases (STDs), Hepatitis, and Tuberculosis (TB) complex epidemics. These data provide insight into how the DC Department of Health (DC Health) in partnership with community can continue to make progress for the health of District residents. The number of new HIV diagnoses remained level while there was continued improvement and new records achieved on HIV health outcomes. There were significant increases in reported STDs reflecting enhanced screening efforts. New hepatitis C diagnoses declined and more persons were cured. The District has the direction, strategies, collaboration, and data to inform its actions.